Today, Rick Toone and Robert Irizarry (of buildingtheergonomicguitar.com) launched a new site called eLUTHERIE.org, which is a community for exchanging designs and ideas related to improving string instruments. I am thrilled to be one of their featured guests and part of the Marketplace. I am very excited about this new development. I myself decided early to make my works public and try to engage my visitors in my design process, and also place trust in the global community that my thoughts will not be misused. eLUTHERIE.org is a step in the same direction, fostering collaboration and sharing, and ultimately better stringed instruments. I look forward to being part of it. 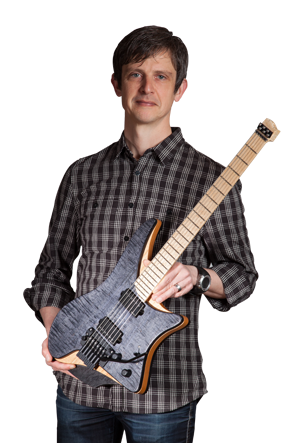 Strandberg Guitarworks is precisely the type of entrepreneurial start-up we hope will benefit from increased public exposure through eLUTHERIE.org — first by gaining visibility and second by attracting collaborators. I love your business model, and your iterative global design process. It promotes much faster and more efficient beta testing. I also believe your choice to openly share your thoughts and “trust the global community” is a valid commercial decision. Yours is one business model I knew would be important to include as we designed the philosophy behind eLUTHERIE.org. Here are several possibilities how the Design & Technology Exchange could help you. As your reputation for innovative design grows, due to exposure on your website and participation in eLUTHERIE.org (among other places), you will become a sought-after collaborator for others who are developing related technology. In this instance “collaborator” is defined specifically as some form of partnership in a profit-sharing business venture. This is different from the not-for-profit information exchanges you have with visitors to your website. The collaboration partnership(s) you form may or may not use the same business model you’ve chosen for Strandberg Guitarworks. For example, perhaps you contribute your skills to a business venture based on technology another inventor has already created. Perhaps that venture — or one of your own future ventures — is based on a licensing model, suitable for mass production. Or you participate in a limited crowd-sourcing design collaborative, where twenty inventors pool financial and intellectual resources to design and create a new form of instrument amplification technology. Or perhaps the complexity of a particular design requires extensive central planning and research archives. Each of these is a plausible scenario. Multiple “micro-partnerships” like these could lead to a steady trickle of income from diverse sources and situations, which I think is a powerful business model during uncertain global financial change. Most importantly, you always retain choice over how your ideas are used: for profit…or donated for the benefit of humankind. Each of us as individual inventors and luthiers could duplicate all of the business and marketing steps listed above. But it would require an enormous investment of personal time, money and effort to reach the same level of public exposure. ELUTHERIE.org simplifies and speeds your progress by eliminating duplication of effort.